Read report on Fisherman's Post website. Click Here. David Moore with a 5 lb. 7 oz. spanish that fell for a Gotcha plug off the Jolly Roger Pier. Chris, of Surf City Pier, reports that small spots are coming in on bloodworms (though shrimp have been working, too). Spanish mackerel have shown up and are biting silver Gotcha plugs, as are plenty of bluefish. Anglers using Diamond jigs haven’t had as much success lately. Flounder are going after live shrimp, while sea mullets are taking bait shrimp after dark. One spadefish was also recently caught. Ray, of Spring Tide Guide Service, reports that the massive schools of red drum have started to break up, which is normal for this time of year. Most of the fish being caught now are coming from creek mouths around area inlets. Due to sporadic rain, it’s been hard to find the best time to catch fish, but if you can get out to the inlets during a changing tide that coincides with the early morning, that’s your best bet. Most of the reds are biting cut menhaden. Artificial baits (other than topwaters) don’t seem to be working as well. The weather has made it hard to go off the beach, but a decent spanish bite can still be found if the weather allows. Clarkspoons (size 00) in gold and pink will increase your chances of finding fish. Marc, of Bad Habit Sportfishing, reports that while the nearshore spanish and bluefish bite had been running hot before the recent spell of bad weather, action has slowed down due to the dirty water caused by the rain and swell. With that being said, big spanish have been found by switching to Yo-Zuri Deep Divers instead of traditional spoon setups. Overall, once the weather settles, expect both the spanish and bluefish bite to pick back up quickly. Kings have been biting on the reefs and live bottoms in 60-80’ of water. Both live and dead bait have been productive. Bottom fishing seems to be best in 100’ or so of water. Cut baits or jigs will get the job done. In the Stream, mahi are the most abundant species, but a few tuna, wahoo, and billfish have been biting as well. If the weather allows you to get out there, use a Supra Dart or Mini Agitator from Eye Catcher Lures in front of ballyhoo to get the best shot at the dolphin. 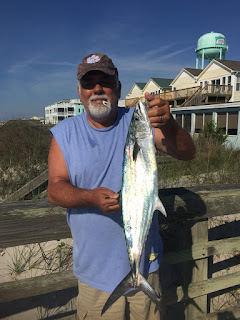 Jim, of Plan 9 Charters, reports that the spanish mackerel bite has been steady along the beach, with most fish being found in 20-40’ of water. Clarkspoons on planers and trolling weights have been working the best. Some fish are also being caught by casting small jigs. King mackerel are being landed in the 5-15 and 20 mile ranges on dead bait, ballyhoo, and spoons. The occasional mahi has been mixed in with the kings in the 20 mile area. The bottom bite has been steady from 15-30 miles offshore. Cut bait has accounted for the vast majority of the catch, which includes sea bass, grouper, triggerfish, and snapper. Joe, of Seaview Fishing Pier, reports that spanish mackerel, bluefish, black drum, and small croakers are all biting. Plugs are working on the spanish and blues, while shrimp are the most effective for the other species. Thanks to Fisherman's Post for this TOPSAIL/SNEADS FERRY AREA TOPSAIL/SNEADS FERRY AREA fishing report. Check out more fishing reports at Fisherman's Post. 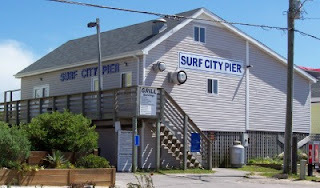 Check out my favorite Topsail Area fishing pier, Surf City Ocean Pier.